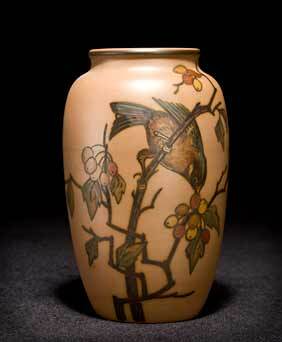 Hjorth bird vase II - 6½" (165 mm) high. L Hjorth set up his pottery in Bornholm, an island off the coast of Sweden, in 1859. Erik Hjorth, his grandson, who lived from 1906 to 1982, spent his whole working life at the pottery. His work is included in the Milner-White collection.